Japan is a country of specific etiquette. Correct manners are very important to the Japanese. It’s very easy to embarrass yourself in Japan as an American. I started my Asia trip in Japan and as is their custom I began each meal with the wet towel. Japan is a society of cleanliness. It is a culture of bath houses and onsens. You have never seen so many people brushing their teeth and gargling (Japanese are obsessed with gargling as a cure for everything) in public restrooms. They carry handkerchiefs in case there is nothing to dry their hands with in a public restroom. The towel is called an o-shibori. A typical o-shibori, made of cloth, is dampened with water and wrung. It is then placed on the dining table for customers to wipe their hands before or during the meal. 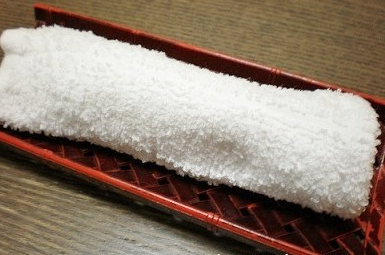 The o-shibori is often rolled or folded and given to the customer on a tray. Even if a tray is not used, it is usually rolled up into a long, thin shape. Cold ones are used in summer and hot ones are used in winter. Airlines, also give out disposable towels containing a sterilizing agent such as alcohol or chlorine dioxide. Traveling on different Asian Airlines, the smell wafts through the plane as everyone rips open their towels as soon as they are given them. The custom continued in restaurants and airlines in Thailand, Viet Nam and Cambodia. It is interesting because these are countries with unclean water and questionable sanitation. There is something civilized about the understanding between the patron and the restaurant that your hands must be clean before you eat. I wondered why we did not have that concept in America. Do they just assume our hands are clean? Do they not care? I like the towel. For me it means to stop and focus on what we are doing now. We are about to do something important. We are about to have a meal. This entry was posted in Asia, Cambodia, Japan, Southeast Asia, Thailand, travel, Viet Nam and tagged cleanliness, disposable towels, Japan, o-shibori, wet towels by jaynezak. Bookmark the permalink.